When it comes to social media, it is often hard to explain the difference between a company that "get's it" and a company that don't. It is a combination of so many different factors. Do you have a product worth sharing? Do you have a product schedule worth following? Do you have a social culture? Sure there are tactics, tips and ideas that might get your social channels going with varies levels of success (especially in the long run). One of the key elements that most brands do not seem to "get" is that social success means that you reach a point in which you are only a small part of the equation. That is, when people share because they want to share - not because you ask them to. With that said, I want to show you three social media case studies that tell the story better than most. From the same company no less. About 15 miles from where I live, you can find the headquarters of Bestseller. It is one of the worlds largest fashion companies and they have a wide range of brands. One of these is Vero Moda (you might have heard about them). Note: I am not associated with them in any way. Here is the thing about Vero Moda. They have, like so many other companies, decided to block the use of Facebook in the company - except for a couple of people in marketing who "are allowed" to post updates. The result is showing. First, their Facebook page have no community to speak off, and all the posts are merely links to their blogs. It is totally focused on broadcasting marketing messages. As a result, Vero Moda, a big international company, only have 12,818 likes - and an engagement level that is so low that it is likely to produce negative ROI. They do have the right products. They produce about 1,400 unique pieces of clothes each year, so they got a lot to share. And they do have the right product schedule. But they have no culture, and they are treating social media the same way as they threat advertising in magazines. They publish. You give them exposure - and that's it. And with a company policy of blocking Facebook, there is no motivation for change. How can you interact when management says it is forbidden? Vero Moda's official Facebook is a perfect case study of what not to do. But here is the funny part. While Vero Moda's official (and global) Facebook page is a failure, their Icelandic Facebook page is a fabulous success. Iceland is a very small country in the North Atlantic Ocean. Its population is only 311,058 people. It is tiny. How many likes do you think Vero Moda Iceland has? They have a staggering 16,435 likes - roughly reaching 5% of the population of that country. It is a phenomenal "population to likes" rate. So what is the difference between the official page and the ones run locally in Iceland? Well, the Icelandic Facebook page is clearly driven by people with a social culture. They make sure to keep their fans up-to-date with all the latest. They engage, ask and answer questions, they communicate rather than present. And just like that, with the same product and the same product schedules, a few people in a tiny country completely dwarfs the official Facebook page. 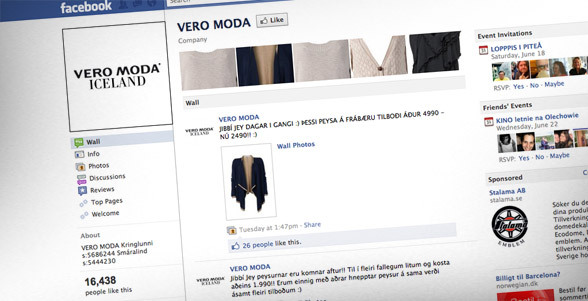 Another example, still from Vero Moda, is the Facebook page of Vero Moda in the Middle East. This page is, as far as I know, run by their agent in that area, and they too have a social culture. They too communicate and get people involved. 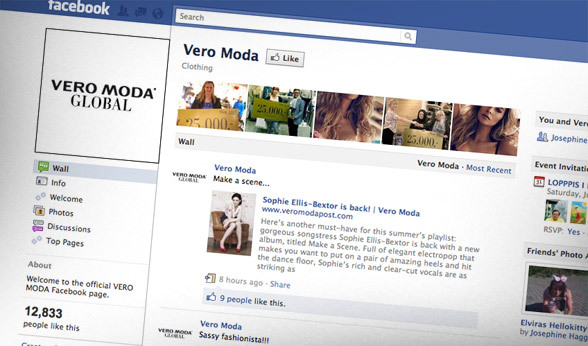 Vero Moda Middle East has 227,725 likes - 18 times more than the official page. Again, with the same product and the same product schedules. It is the culture that matters. If you want social media to work, do it *with* your fans, for the sake of your fans. Not *to* your fans, for the sake of marketing. And most of all, you got to work for it.